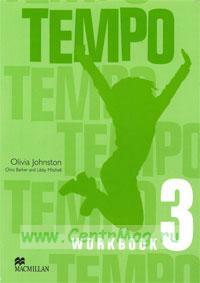 TEMPO is a new three-level course for young teenagers which takes students from beginner to pre-intermediate level. The Student's Book presents and practises language through dialogues and texts that reflect the students' own reality. Grammar and vocabulary are highlighted in grammar focus boxes and in illustrated vocabulary sections.There is regular recycling and revision through photostories, cartoon strips, games and songs. Portfolio sections allow students to work collaboratively on projects and to build up a personal dossier about themselves, their interests and the world around them. The Workbook provides further practice linked to the Student's Book. It contains vocabulary and dialogue work, grammar practice, culture spots, skills developments and study tips. Each unit opens with an easy-to-understand grammar review (Grammar File), and ends with a check section (Let's Check). The Teacher's Book contains lesson notes, tapescripts and answer keys, as well as ideas for extra activities. Workbook with CD-ROM - an edition of the Workbook including a fun CD-ROM for students to use at home or in class.The CD-ROM contains games, puzzles and crosswords linked to the course. The Test Book contains tests for the teacher to use at regular intervals to assess the students' progress.